Hiya! I’m back from a little February hiatus and though I wish I could say I was laying on beach somewhere rather than laying in a hospital bed, I’m happy to have taken a little break to rest my brain and body. I’m super (totally just wrote “supper” – I’m not surprisingly hungry right now) happy to be back though! 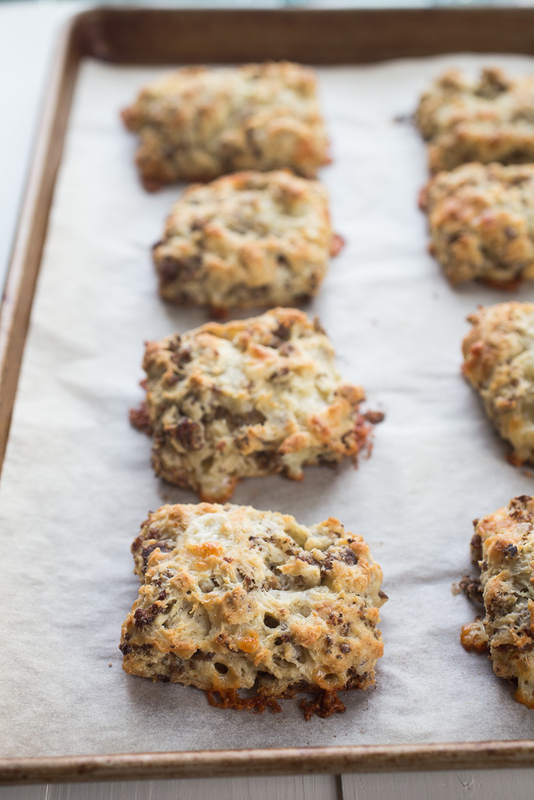 Because these sausage and sharp cheddar biscuits needed to be shared. And you need to make them like #rightthissecond. 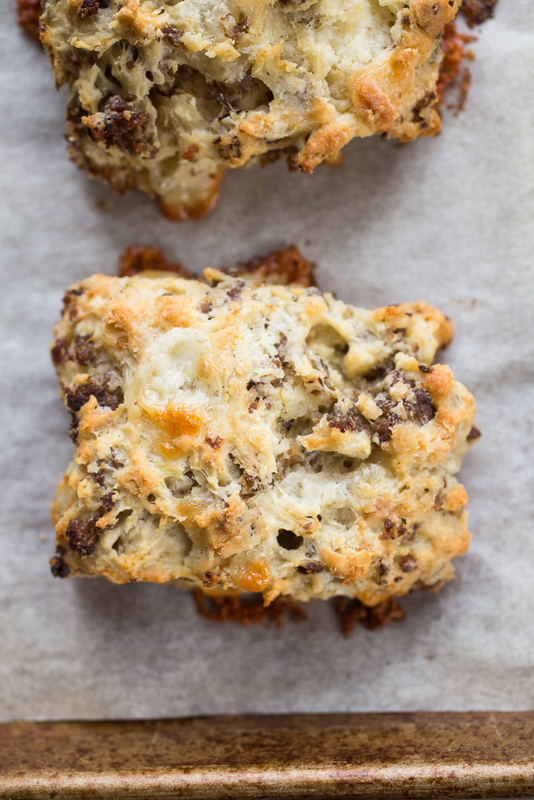 Sausage and sharp cheddar biscuits, you ask? Oh my yes! 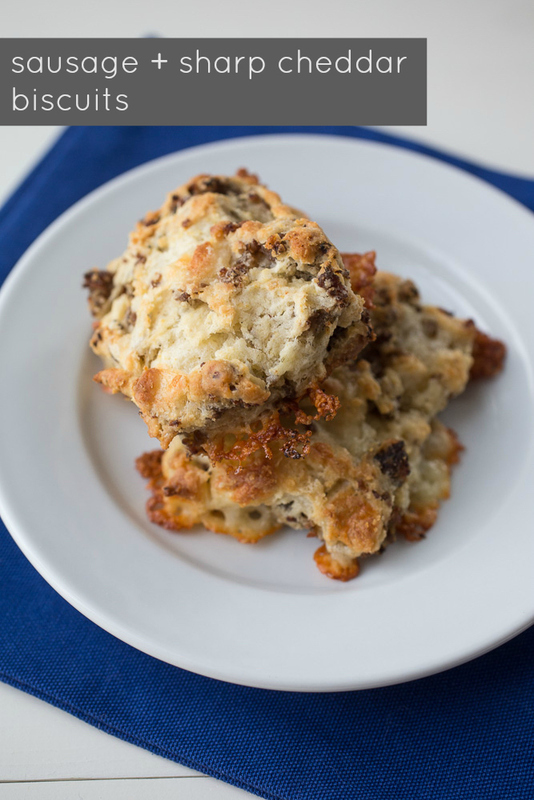 Spicy ground breakfast sausage is cooked up and then folded into sharp cheddar biscuit dough. 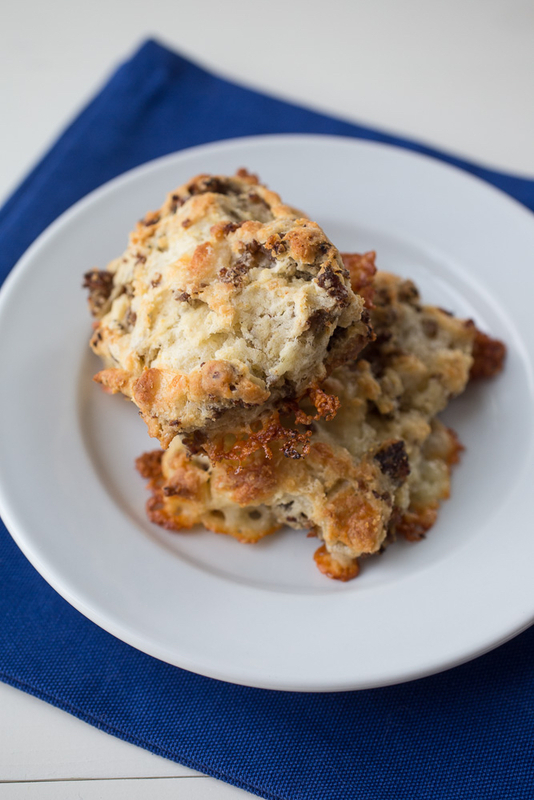 I’m not a stranger to sharp cheddar or cheddar and pork, for that matter, in my breakfast treats so these biscuits were right up my alley when I came across them a few years ago. Why I keep sitting on recipes like this one, I have no idea. In the bowl of a food processor, combine the flour, baking powder, baking soda, salt, garlic powder, and oregano. Pulse a few times. Add the butter and pulse 8 to 10 times, until the mixture is crumbly and resembles coarse sand. Dump into a large mixing bowl and stir in the buttermilk, sausage, and cheese, mixing with a wooden spoon to evenly to distribute (but not overworking the dough). If dough seems very dry or crumbly, add another tablespoon or two of buttermilk. Transfer the dough to a piece of parchment paper or a lightly floured work surface, and knead a few times to form a cohesive dough. Pat and roll the dough into a rectangle about 3/4? thick. Cut the dough into 16 squares using a sharp knife, or use a biscuit cutter to cut out the pieces. Place the biscuits on a parchment-lined baking sheet, spaced at least 1 inch apart. At this point, the biscuits can be frozen or chilled in the refrigerator. When ready to cook, bake at 425 degrees Fahrenheit for 13-15 minutes or until medium to deep golden brown. Preheat oven to 425° F and line two large baking sheets with parchment paper. Dump into a large mixing bowl and stir in the buttermilk, sausage, and cheeses, mixing evenly to distribute (but not overworking the dough). If dough seems very dry or crumbly, add another tablespoon or two of buttermilk. Transfer the dough to a piece of parchment paper or a lightly floured work surface, and knead a few times to form a cohesive dough. Pat and roll the dough into a rectangle about ¾-inch thick. Cut the dough into 16 squares using a sharp knife, or use a biscuit cutter to cut out the pieces. Place the biscuits on a parchment-lined baking sheet, spaced at least 1 inch apart. At this point, the biscuits can be frozen or chilled in the refrigerator. Bake for 13-15 minutes or until medium to deep golden brown. Transfer pans to wire racks and allow the biscuits to cool for 5 minutes before serving. My husband would love these paired with some eggs for breakfast. Thanks for the recipe. You’re so welcome! We just pulled some from the freezer for dinner last week and made some of our favorite cheesy eggs to go alongside the biscuits – such a great dinner! I know this is a ton of sausage and cheese, so if you d like, you could definitely cut both in half and still have an incredibly tasty biscuit that would be a little more balanced in the add-in department. Next time I will add more baking soda and baking powder, use breakfast sausage and replace half of the cheddar with Swiss.